With the research assistance of the wife (an actual doctor of robotics and such), I've uncovered a quite shocking case of academic plagiarism. 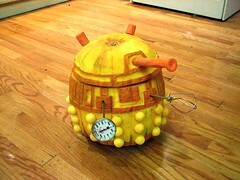 The University of Essex is flaunting its creation of what can only be described as a robotic pumpkin Dalek, to be formally revealed today on that important outlet for research dissemination, the Richard and Judy show. Back to your robot laboratories, so-called researchers of Essex, and get on with the important work of meddling with things with which man should not meddle with. And to the rest of you, happy Halloween.